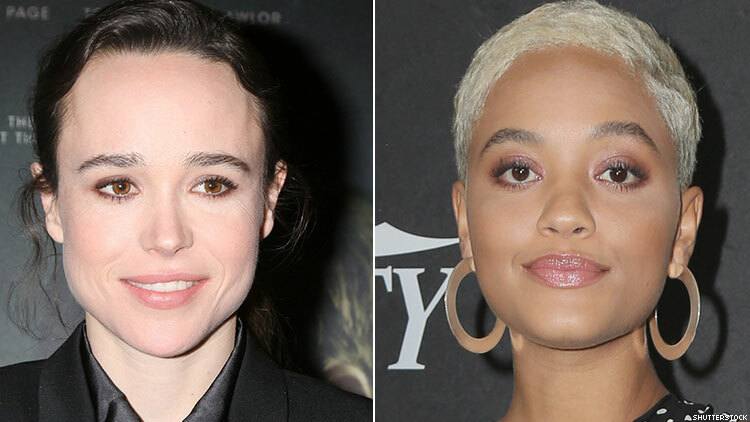 The all-female queer Casablanca we never knew we needed until it was dreamed into existence is happening for one night only in Los Angeles with Ellen Page slipping on Humphrey Bogart’s trench coat as Rick and Kiersey Clemons playing Ingrid Bergman’s Ilsa in a staged reading, according to Entertainment Weekly. The performance is part of an ongoing collaboration between Page and her Juno director, Jason Reitman, who has previously staged an all-female reading of Glengarry Glen Ross and a performance or Reservoir Dogs starring only people of color. Page famously came out of the closet as gay in 2014, and Clemons, who recently starred in the sweet queer-themed indie Hearts Beat Loud, has identified as queer since very early in her career. But the rest of the cast is all LGBTQ except for ally Olivia Wilde, who'll play Ilsa's spouse. Comedian Hannah Gadsby, whose visceral Netflix special Nanette cemented her as one of the most important voices in years, will play the Vichy law enforcement officer Captain Renault. Meanwhile, Schitt’s Creek’s Emily Hampshire, who recently asked her girlfriend Teddy Geiger to marry her, will play Ugarte, the part that Peter Lorre played in Michael Curtiz’s 1942 masterpiece. If all of that weren’t enough, Pose sensation Indya Moore is slated to play the critical role of Carl the waiter, who comes to Rick’s aid at several points. The staged reading of Casablanca will take place December 13 at Los Angeles’s Ace Hotel.